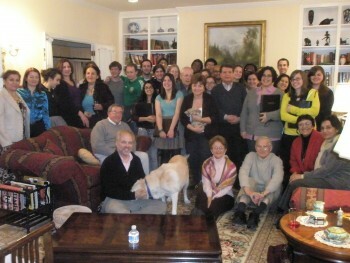 Tom Lloyd (seated, front left) and the bi-college Chamber Singers with members of the Turkish American Friendship Society of the U.S., who prepared a Turkish pot-luck supper for the group. The Chamber Singers of Bryn Mawr and Haverford Colleges will travel to Turkey in March for the group's sixth international cultural exchange tour. The bi-co ensemble has been preparing for the trip with special lectures and a dinner hosted by a local Turkish-American group, and will perform a farewell concert on Monday, Mar. 1. The students who perform with the Chamber Singers of Bryn Mawr and Haverford Colleges will not be experiencing a“typical” spring break this year. Instead, the bi-college group of 35 students and three faculty members, led by Haverford Associate Professor of Music Thomas Lloyd, will travel to Turkey March 4-14 to perform concerts with the choirs at Middle East Technical, Anadolu, and Bogazici Universities. The group will also participate in discussions with university students about cultural and political issues. In addition to practicing pieces from the Turkish repertoire, the Chamber Singers have prepared for the trip by attending lectures on Turkish history and culture. These talks have featured bi-college faculty members and guest speakers such as John Morgan O'Connell, an ethnomusicologist from the University of Cardiff, Wales. O'Connell is a leading authority on Turkish vocal music and the changes it has undergone since the Kemalist revolution of the 1920s, which aimed to create a nation-state from the Turkish remnants of the Ottoman Empire. The Chamber Singers were also recently treated to a Turkish pot-luck supper hosted by the Philadelphia-based Turkish American Friendship Society of the U.S. (TAFSUS). Fifteen members of TAFSUS prepared a banquet of common Turkish dishes for Lloyd and the students who attended. The group's trip is funded in part by the Turkish Cultural Foundation of Washington, D.C., which will also arrange a visit for the students to one of the Foundation's special music programs in a low-income neighborhood in Istanbul. Other sponsors include Haverford's Center for Peace and Global Citizenship; the offices of the Provost and President at Haverford; the office of the Provost at Bryn Mawr College; the Louis Green Fund at Haverford; the Chamber Singers Tour Fund; the Haverford College Faculty Research Fund; and anonymous donations by parents of current students at Haverford and Bryn Mawr. The group will perform a farewell concert on Monday, March 1, at 4:30 p.m. in Founders Great Hall. Before and during the trip, students will blog at http://news.haverford.edu/blogs/music. The Chamber Singers will discuss their trip in post-tour presentations on Thursday, March 25, at 4:30 p.m. in Haverford College's MacCrate Recital Hall; and Thursday, April 8 at 4:30 p.m. in Bryn Mawr College's Goodhart Hall Music Room.